Spread-spectrum radios are very popular for creating wireless communication links to and between data loggers. These low-cost devices provide robust links ranging in speeds from 10 to 200 kbps and distances of 3 to 50 miles, depending on the radio model and operating conditions. These radios consume little power and are easy to install and maintain, as they have been designed for low-power, non-licensed operation. Spread-spectrum radios spread the normally narrow-band information signal over a relatively wide band of frequencies. This allows the communication to be highly immune to noise and interference from RF (radio-frequency) sources. If you are unsure if spread-spectrum communications is right for you, you can try before you buy. 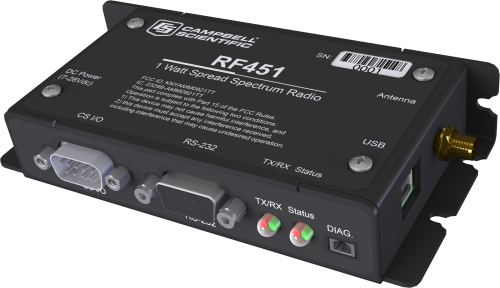 Campbell Scientific offers a 900 MHz spread-spectrum demonstration kit that allows you to easily test communications from one point to another using the RF407 and RF451 radios. Is an individual FCC license required to use a spread-spectrum radio? No. A spread-spectrum radio, like all FCC Part 15 devices, is not allowed to cause harmful interferences to licensed radio communications and must accept any interference that it receives. How does a spread-spectrum radio work? Spread-spectrum radios work by frequency hopping and transmitting at discrete frequencies over part of the unlicensed band, rather than by transmitting over a very wide part of the spectrum as some other devices do. Can a spread-spectrum radio be used as a repeater in an RF telemetry network? Can a spread-spectrum radio be used to connect two computers without a data logger? Yes. Two spread-spectrum radios can be used to connect two computers. Is there a recommended RF filter for removing local interference while using a spread-spectrum radio? No. Removing the interference will remove the radio signal. The radio, like all FCC Part 15 devices, is not allowed to cause harmful interferences to licensed radio communications and must accept any interference that it receives.